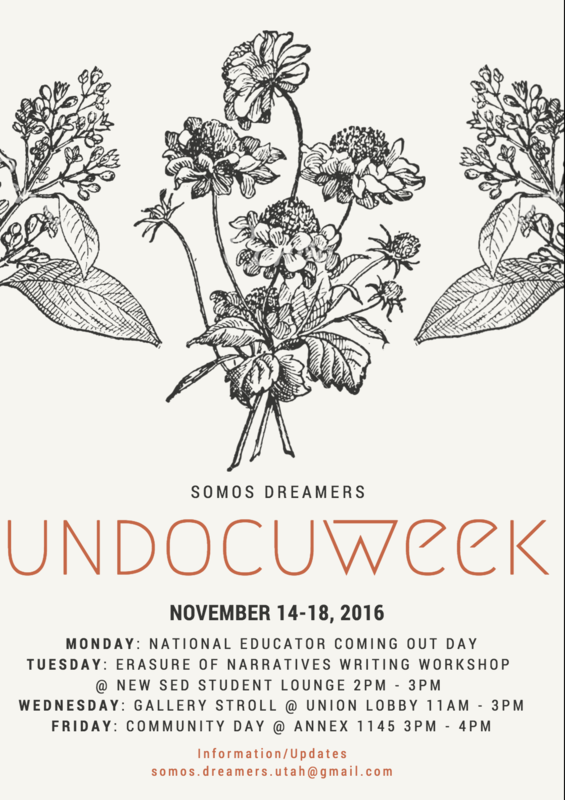 National Educator Coming Out Day: As students have come out and revealed their status as undocumented immigrants, it is now their educators turn! We will be going around to find staff, faculty, advisors, and educators who are our allies and/or are with us in the struggle! This day is part of the national movement organized by United We Dream. Erasure of Narratives Writing Workshop: This event will be hosted by our very own Juan Rodriguez and Javier Hernandez. Gallery Stroll: The theme of this year’s gallery is “Things I’ll Never Say” made by local undocumented organizers, students, allies, et al. Community Day: For us to celebrate the inaugural UndocUweek, reflecting on events, and what we can expect for years to come!